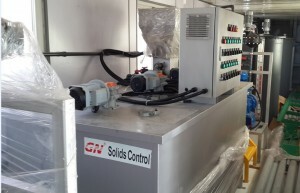 GN Solids Control has already developed the 20 foot containerized dewatering unit for drilling mud recovery, as without the chemically enhanced technology, operators would be left with the accumulation of colloidal and ultra-fine drilled solids in the drilling mud circulating system. Ultimately leading to excessive mud densities, pipe torque/drag, mud loss, disposal fees, and overall well cost. GN 20 foot containerized dewatering unit including all the components for adding chemicals, dewatering polymers,and mixing systems. The dewatering unit control system is organized by the PLC system to allow automatically operation. The customter mostly use the dewatering unit for water based mud.The result is a polymer-enhanced flocculation of colloidal and ultra-fine drilled solids that can be efficiently removed by a GN high Speed decanter centrifuge. 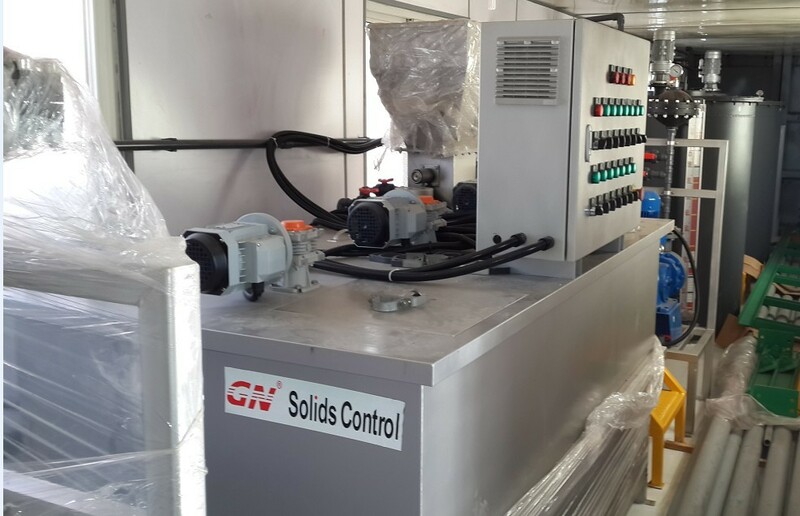 The customer can choose to have the decanter centrifuge on a separate skid or included in the dewatering unit container, in such case the container should be 40 foot size to have enough space for setting up the centrifuges and the feeding pumps. The Dewatering unit application at the well allowed reduction of the liquid-waste volume by 32% for the first two sections and by 27% for the entire well. Around 350 m3 of water was returned to the system for fresh drilling fluid mixing thus reducing the cost of water delivery. All drilling fluid left after the last section was also processed through the Dewatering unit and the returned water was used for completion operations. Although application of the Dewatering unit added additional upfront cost to the well construction, the waste-volume reduction allowed a 20% waste disposal saving as compared to offset wells. The two top sections in the oil field drilled through massive reactive-clay layers. Despite the high efficiency of the solids-control equipment and the use of inhibitive drilling fluid, the high ROP in the top sections lead to dump-and-dilution to maintain the fluid properties at the desired specification. A significant portion of the waste volume generated while drilling came from the dump-and-dilution process. High waste volumes generated while drilling influence waste disposal cost and overall well construction economics. In order to reduce waste volume, the operator requested the development of an integrated approach for drilling fluid and waste management focused on drilling-waste reduction. After a technical evaluation of the proposed options, it was decided to install a Dewatering unit and evaluate its performance. To ensure effective performance of the Dewatering unit, the drilling company performed a rig audit and developed recommendations for the proper equipment installation to fit the existing solids-control equipment layout. A special polymer was applied for the flocculation of inhibitive potassium chloride-base drilling fluid. The application of new chemicals allowed an increase in the efficiency of the Dewatering unit and a reduction of chemicals cost. The total savings on drilling-waste volume utilization of 20% was achieved due to the Dewatering unit technology application, the economics of the technology based on processing of the dumped volume and returning of recovered volume back to the active system. Application of the Dewatering unit not only allowed savings in waste utilization but also a reduction of makeup water consumption. 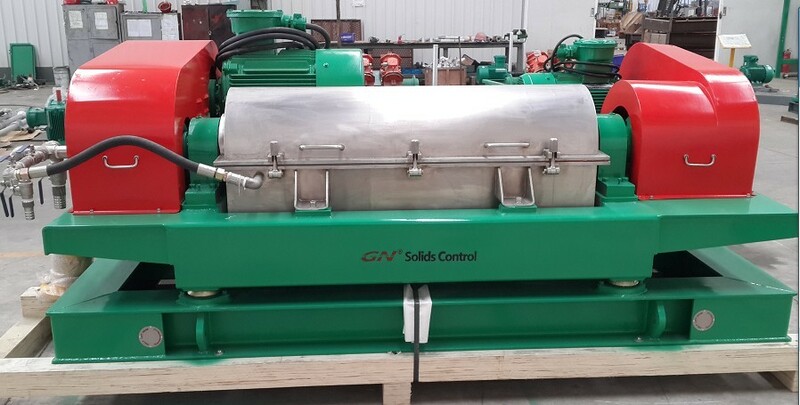 If you want to learn more of the specifications and prices for the dewatering unit from GN Solids Control, please email to us: salas@gnsolidscontrol.com or call us at + 86-315-5276988. You can also check more info. about GN Dewatering VFD centrifuges with big bowl or small bowls.